The home had been known to police for drug activity due to repeated complaints from neighbors. One resident said that it was obvious that groups of unrelated people would appear in front of the house, send a text and then be allowed in. Not long after, the same people would leave but in separate directions. “We received it from various venues from neighborhood meetings to our Coffee With Cops program that we hold on Willy Street on Wednesday mornings. It came from several different sources.” Schwartz said. 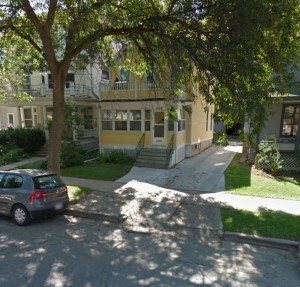 The two unit property is owned by Keith Hanson whose family has owned the home since the 1980s. Neighbors WSB talked with say that the tenants, presumably in the lower unit, presumably Ragland, were eight months behind on rent and they had been tough to evict.The neighbors also said that the upstairs tenants had moved out because chemical smells from the lower unit were too difficult to take. While early information from witnesses suggested a second arrest was made later in the day, Schwartz says Ragland is the only person in custody related to the case. She added that the investigation continues and other arrests could possibly occur. Ragland has a long and serious criminal background including multiple conviction for possession, battery, resisting arrest and one pending case for battery. “We are happy that we were able to address this problem and hopefully it put some of those neighbors that live in that block at ease.” Scharwtz said. Caffeinated Politics Blogger and Spaight Street resident Gregory Humphrey reported being greeted by four Madison Police officers while mowing his lawn. 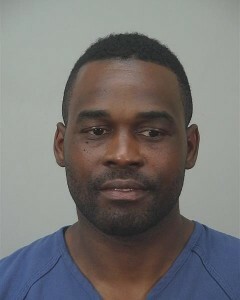 He wrote in an email to the Marquette Neighborhood list serv that after the military-style truck arrived a van followed and unloaded a group of officers which traversed Humphrey’s property before taking 909 Jenifer from the rear. “I had conversations after the event with three officers and two of them laid out the need for the raid and also thanked the neighbors who have called and worked to make sure this community does not have such activity taking place. The second person they are seeking has a parole violation,” Humphrey wrote. The raid was not related to two other drug-related police operations that occurred across town today. One was in the 2400 block of Atwood Avenue and a traffic stop on the West Side. The large military-style truck that appeared in front of the target home was apparently Army surplus and was acquired by the Madison Police for free or a very small sum because it was destined for scrap according to what an officer told a neighbor across the street. In the wake of the unrest in Ferguson, Missouri almost a year ago, renewed focus has been placed on surplus military equipment that has been acquired by civilian police forces. 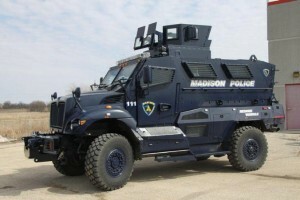 The Madison Police vehicle seen today was impressive to residents but also quite imposing. A quick tour of the Madison Police website does not highlight the vehicle but rather shows a group picture of all the officers involved in SWAT. No doubt it’s appearance today is likely to spark further discussion about Madison Police tactics, training, and equipment. 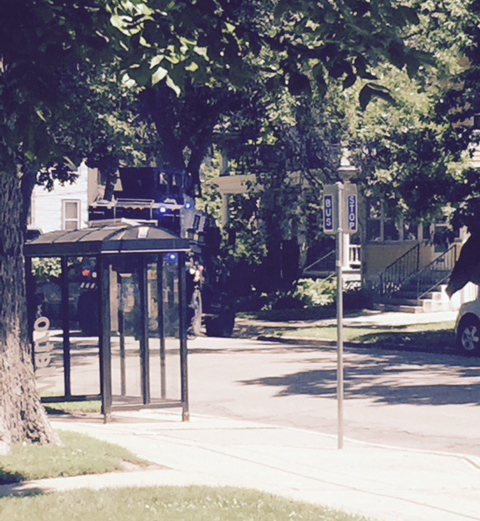 Update: [1:15 p.m.] Information from Madison police, suspect name. This entry was posted in Madison, Willy Street, Willy Street Commentary and tagged Drug Raid, Jenifer Street, Madison Police, Madison Police SWAT Team by TheEastSider. Bookmark the permalink. The fact that you refer to the officer’s tools as “toys”, shows such a disrespect for what they do and the dangers they face. But, not surprising. Perhaps a few more quotes from Mr Humphrey’s article, and his purpose for writing it, would have been appropriate. Oh wait, I forgot where I am.